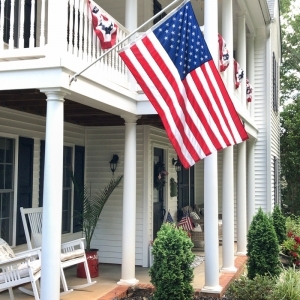 Fourth of July barbecues, cookouts, and neighborhood parades call for festive July 4th decorations! 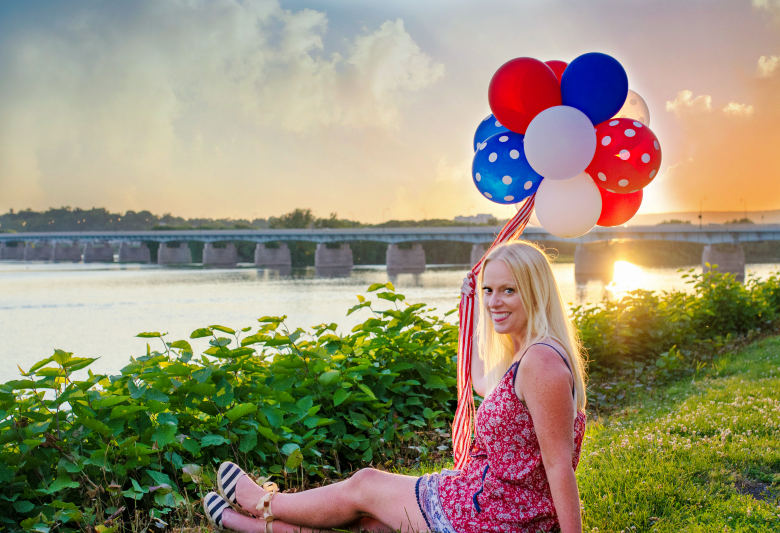 Balloons are a simple way to make any celebration whimsical and fun. With the Balloon Time Helium Tank, you can create the magic anytime and anywhere. 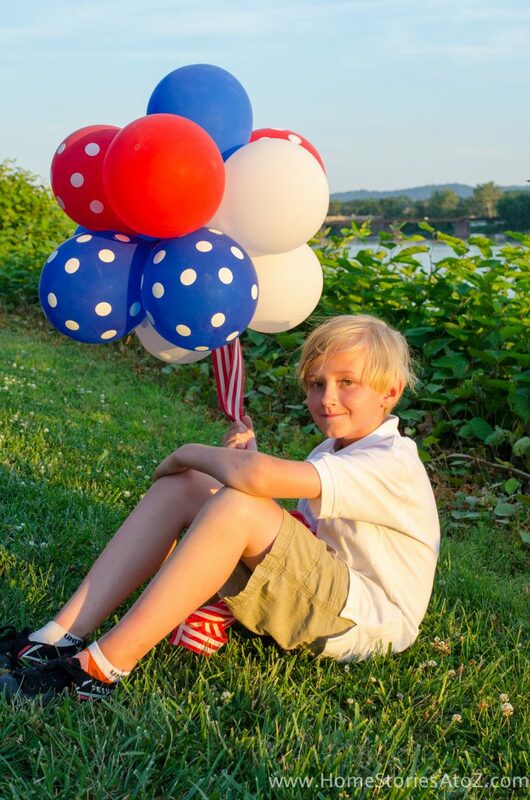 Today I’m going to teach you how to amp up your Fourth of July parties and barbeques with these adorable balloon topiary balls. Grab a pink Balloon Time tank, and let’s get started! Inflate 12 balloons using the Balloon Time Helium Tank. The tank is so easy to use and a lot of fun! Simply rotate the knob four times counterclockwise to open the tank, place the neck of the balloon firmly on the tank valve, and then push the valve down to inflate the balloon. That’s it! 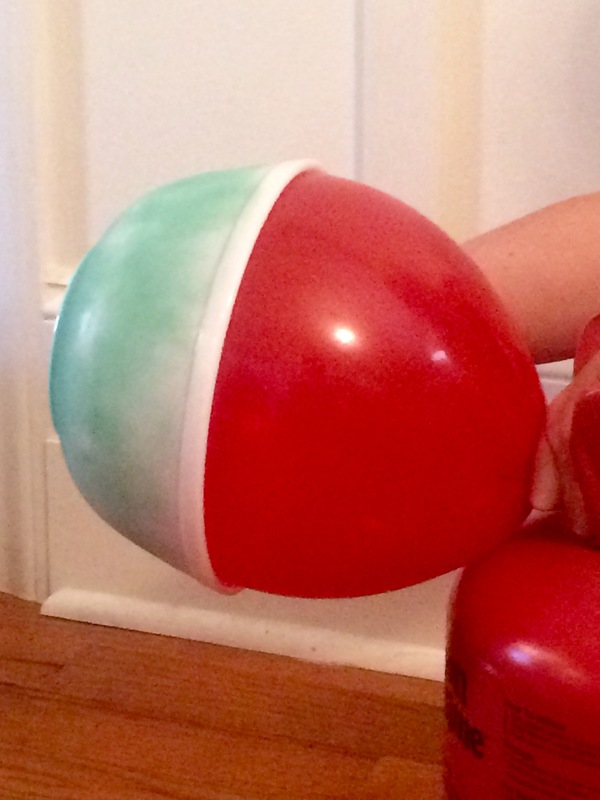 TIP: Instead of buying or making a balloon sizer, use an appropriately sized mixing bowl to ensure that all of your balloons are equally sized. I used a 9 inch pyrex bowl to size my balloons. 2. 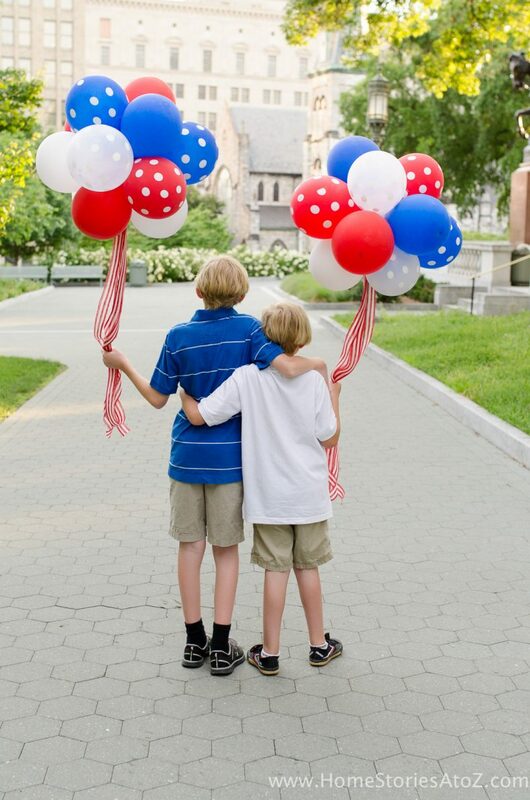 Two balloons tied together at their necks is called a duplet. To create a balloon topiary ball, you will need 6 balloon duplets. TIP: To keep helium balloons from floating to the ceiling while working with them, stuff the balloon duplets into a 40 gallon trash bag until you are ready to use them. 3. Begin making your topiary by wrapping two duplets around each other. 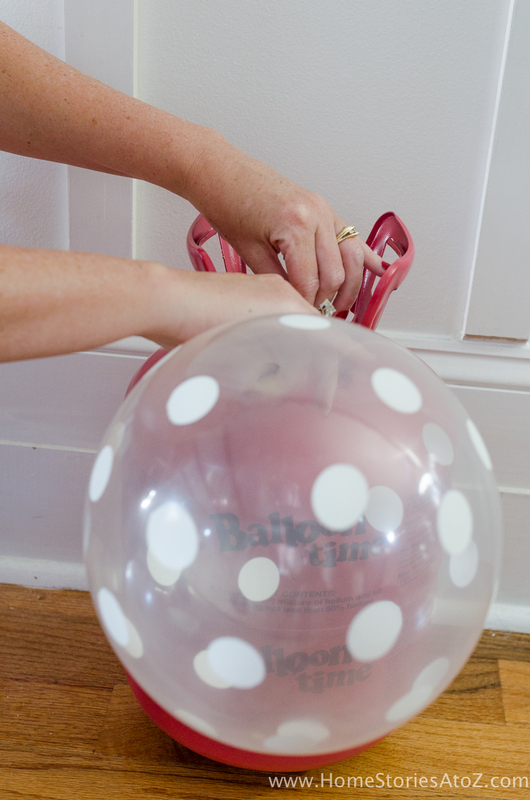 Twist the balloons around each other to lock into place. Add another balloon duplet, pull the balloon necks to the opposite side and twist the balloons around each other to lock. Keep adding duplets and repeating this action until all 6 duplets are used for a total of 12 balloons in one topiary. Click play and watch me create a balloon topiary in a little over a minute! 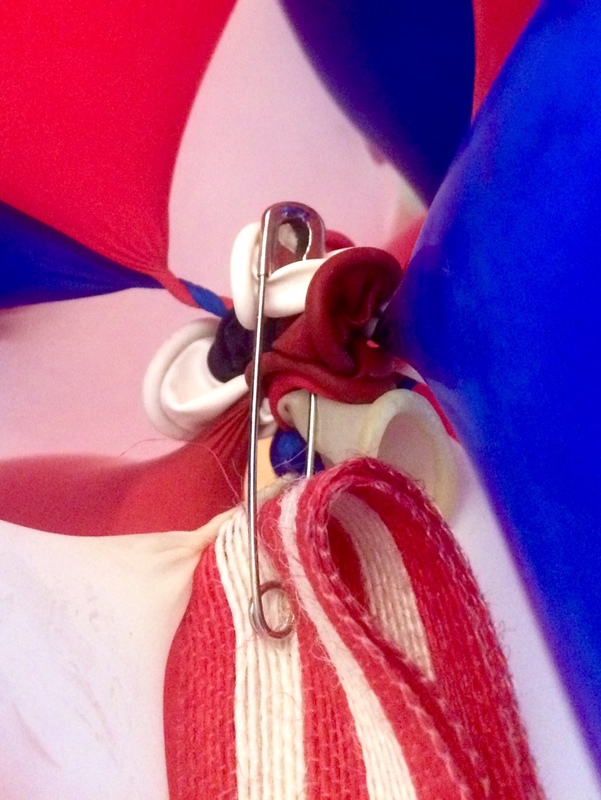 This will give you a better idea of how to wrap and lock each balloon duplet. 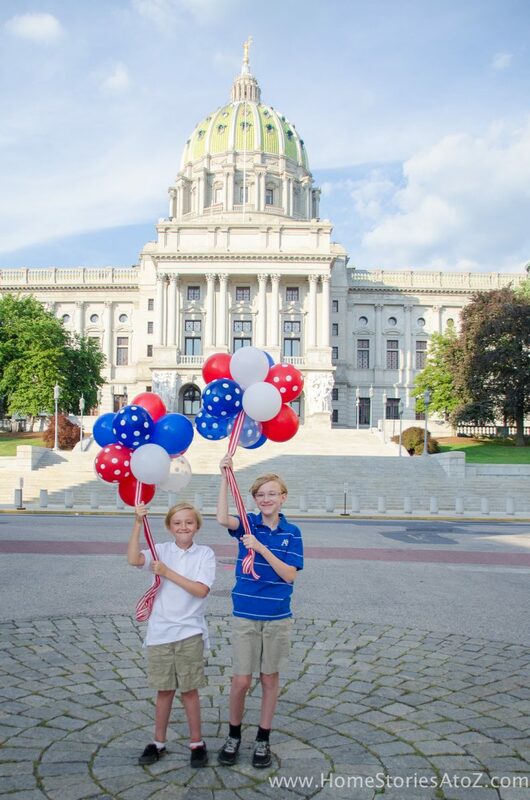 My boys and I had a blast running around the city with our balloon topiaries snapping pics and showing off our patriotic pride. Waiting for the July 4th parade to begin just got a lot more fun! Just be aware of windy weather because when your husband is trying to capture a shot of you holding your cute balloon topiaries this might happen! 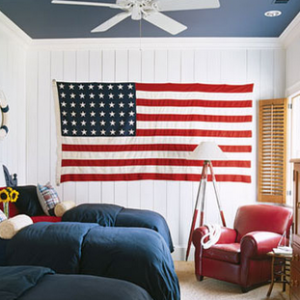  Pin this project for later! 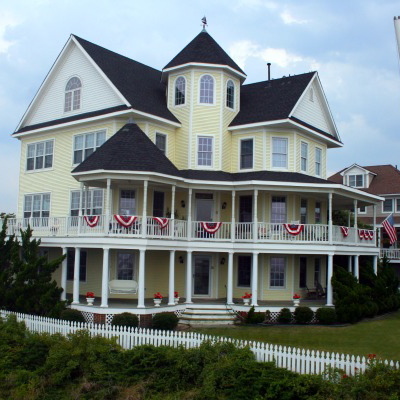 Be sure to visit BalloonTime.com to check out even more tips, tricks and DIY’s!